Movement disorders in children can mean that they are moving too much or too little in a way that interferes with the normal flow of movements and postures. They are caused by the brain and are very common, with up to 25% of pediatric patients having abnormal movements at some point in their lives. There are many causes of movement disorders including structural damage to the brain, medications, infections, autoimmune conditions, and disorders prompted by genetics, among others. Some movement disorders represent a broader problem with the nervous system or a specific disease or disorder, while for others the movement disorder occurs in isolation. Some movement disorders worsen over time, some improve, while others don’t change. 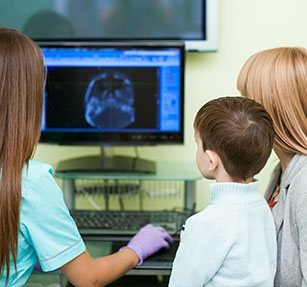 At Boston Medical Center, we offer a multidisciplinary approach to diagnose and treat childhood movement disorders, utilizing the specialized services of Pediatric Neurology, Neuroradiology, Pediatric Psychology, Pediatric Neurosurgery, Pediatric Genetics, and the Adult Neurology Movement Disorders Program. We offer treatments ranging from therapies including comprehensive behavior intervention for tics, medications for all many types of movement disorders, and even deep brain stimulation in select cases. Dr. Karl Kuban, Chief of the Division of Pediatric Neurology is a sponsored consultant to the Tourette Syndrome Association.